To use the Launchpad Pro with Ableton Live, ensure you're using the latest version of Ableton Live from you account here . Your Launchpad Pro should automatically be detected and configured with Ableton Live. 1. Open your Live Preferences. On a Mac, click 'Live' then 'Preferences'. On Windows, click 'Options' then 'Preferences'. 3. Click the first drop down box under Control Surface. Choose Launchpad Pro from the list. 4. 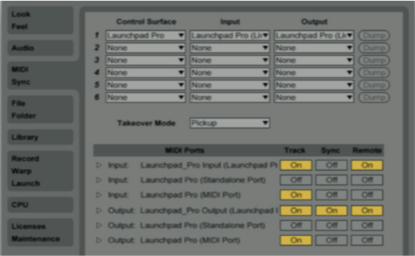 Under Input and Output select Launchpad Pro (Live port). The Session mode button will now light up. You'll now be able to control Live with your Launchpad pro.